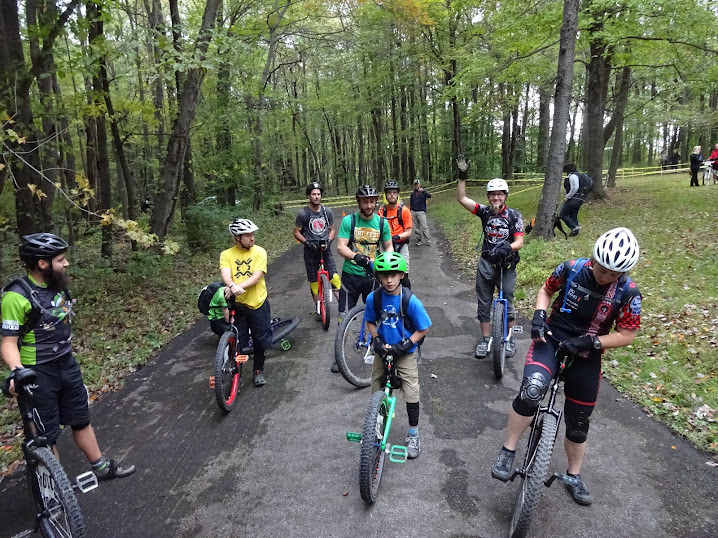 There are many disciplines with in the unicycling community. North American Unicycling Convention and Competition (NAUCC or “Nationals”) are held every year and there are competitions in the various disciplines at each NAUCC event. Nationals are a great way to see how the various disciplines work and meet others who love to ride their unis. It’s also an amazing learning experience, as sometimes the best way to learn a new trick is to watch others and ask them how they learned it. Below is a brief description of each discipline, the uni ridden and any other requirements as well as some video links. Many of the disciplines overlap and therefore there are often multiple events for each competitor to enter. Many disciplines require knee pads and gloves. A helmet is required for MUni and Trials. Distance/Racing - Uni: Standard is under 24”, ungeared w/ cranks no shorter than 125mm. Unlimited class is anything with a virtual wheel larger than 24”. Distance racing is racing that is not on the track, and is longer than 1500m. It may include a Criterium (crit), Marathon, and 10K. Not all distance events are held at all Nationals. It depends on the hosting city and their resources. Distance races are most often pack starts and raced as a group - there are gaps in the pack as the races progresses. A Crit is a short circuit course, often a small city block where the racers complete a set number of laps. There are often standard and unlimited heats as well as age and gender classes. It’s a fast race, because the course is short, and is very spectator friendly. The 10K often has both standard and unlimited class as well. It’s often part road, part park, part bike path. Again, it depends on the host city’s available accommodations. A marathon is 42K (26.2 mi) and often is only offered for the unlimited class. It is often, mostly, a road race. Flatland riding is a combination of Street and Freestyle. It’s a combination of tricks and spins performed outdoors like Street, but without the obstacles in Street. The idea is to combine tricks and spins into a smooth set of motions. Check out these videos. The first one is from the 2011 NAUCC Flatland finals. This video is from 2010 Finals. Freestyle is one of the oldest disciplines and is considered and artistic discipline. It utilizes many skills and tricks that are arranged in a routine that is performed to music, and is often compared to figure skating. There are Individual, Pairs, and Group routines. Presentation and showmanship are a big part of the discipline. The routines are performed in a gym and are judged. This is a video of a group routine. This is a video of a pairs rehearsal, but it gives a good idea of what goes into a routine. Just like it sounds, Uni Hockey and Basketball are played on unis in a gym. The courts are “enclosed” by barriers - often tables or bleachers with padding. There are teams of 5 on the court and the team may have subs, there are no age requirements and teams can be comprised of all ages and both male and female. MUni - Uni: Varies. Most commonly a 24” or 29” with wider and knobbier tires. The frames are often more sturdy to withstand hops, drops, and rocks. MUni means Mountain Unicycling. At Nationals, there are uphill technical, downhill technical and distance MUni races. All are also available as Male or Female Beginner, Advanced, and Expert. The uphill and downhill races are (really) short courses designed to test your ability. The distance is a longer course, similar to a mountain bike race. This is a quick Wobble video of part of a local MUni ride. Skills - Uni: Varies, but most often 20”. It’s suggested that you ride the uni on which you are most comfortable. Skill Levels are a set of skills that are grouped and ranked so as to allow for levels. A rider must test at a lower level before progressing to a higher level. Testing is done by a certified Skills Tester and there are times set aside at Nationals just for testing for your level. There has been some discussion about altering and updating the skills, but for now, these are the accepted levels. There are also the Hutch or Trials levels. The Trials levels were developed to incorporated more skills related to Street/ Flatland/ Trials and MUni riders. There is some overlap, but the two systems are not interchangeable and the Hutch Levels are not officially recognized. Standard skills combines Freestyle and Skills. The riders completes a routine that demonstrates the skills they are able to complete. They are not judged on music or costuming. They are awarded points for each skill mastered and demonstrated in the routine. A routine may contain up to 18 skills and be no longer than 3 minutes. Street is often compared to BMX riding and is done in skate park type settings. Street riding involves jumping off steps, huge flips, grinding rails and spinning the uni. For some competitions, depending on the host city and available facilities, the obstacles or “street” part are sometimes built site specific just for the competition. This is a video of some Street riding. Track - Uni: Varies, based on age, w/ younger racers allowed smaller wheels, but the standard is 24” with cranks no shorter than 125mm. Track events are held on a track. They include 100m, 400m and 800m as well as 1-foot, wheel walk, and an obstacle course. Each National Host can add additional races, such as a slow race or backwards. All track races start from a “block” (upright post) and except for the 800m, you are disqualified if you dismount (you get 1 dismount in the 800). Track day is a great day for beginners to participate, if you can ride unassisted. There are heats based on age and gender with the top riders competing in an Expert Heat. Scoring is timed and point based. The top 5 riders are awarded points. All riders are timed. So even if you don’t earn points, you are giving a time - this is great for shooting for personal bests or comparing yourself to others in different heats. Trials riding is the riding of obstacles made up of pallets, stairs, boards and similiar objects without dismounting or touching anything. Trials are also called Observed Trials. During the competition there are a number of obstacles each rider may attempt to complete. Each obstacle is worth a set number of points based on which “line” you choose. A line is the designated order of completion for that obstacle. Each obstacle can have up to 3 lines for you to choose from, ranked from easiest to hardest. Each rider is given a card that must be signed by the obstacle judge upon completion of that obstacle. Observed Trials is also a good competition for beginner riders, as it is a point based system and you can try and best your points from the previous competition. Many Wobble members really like riding Trials. This is a video of one rider during the NAUCC 2011 Trials competition. This video is of a girl, Sarah, who practices Trials in her family's barn. Which is part of the reason The Wobble likes riding Trials... if you can set up obstacles, you can practice riding.